Algebra I Pre-AP; Laying the Foundation for Calculus AP. 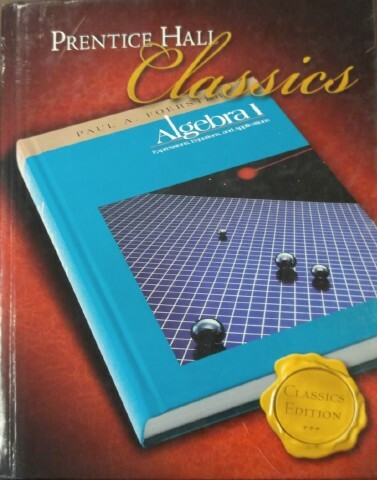 This is a very rigorous, fast-paced, complete High School Algebra I course that provides in-depth coverage of all of the traditional Algebra I topics using functions, and solving of complex traditional and non-traditional real-world problems as the common threads. This class studies topics at the highest level of rigor, at a faster pace, and in more depth than "regular" algebra courses. The curriculum is designed to challenge the most talented math students. In addition to traditional Algebra I topics students in Algebra I Pre-AP will be exposed to topics that are not formally studied until later in the math sequence. Both linear and non-linear functions will be studied in depth in all of their forms, as will their applications. The types of functions we will investigate include linear, quadratic, variation, power, radical, rational, absolute value, exponential growth and decay, and trigonometric functions. Technology is used throughout the course to enhance learning, to help understand concepts, and as tools to help solve real-world problems. This includes use of the SmartBoard, and TI-84+ Graphing Calculators. The ChromeBook computers the boys have are used when Blended Learning is employeed as a teaching/learning technique. Students access specific websites that offer video presentations of pre-selected topics. This may be assigned as homework, or as directed class work. This is the "Flipped Classroom" method of providing students with a wider range of learning procedures that allow them to self-teach certain skills. It is also available as a source for remediation. The 8th grade Pre-AP Algebra course at the Academy ends the first semester grading period on the date of the final class before the holiday break in December. Students in this class will take their semester exam in December. Because of the unique characteristics of this course, and because of the unique situations that traditionally arise that challenge the 8th grade for class time in the second semester, 8th Algebra Pre-AP will end its first semester on the final class day in December. The curriculum has been planned so that grading for the first semester can close in December without any negative impact on student report card grades. This procedure ensures sufficient time to complete the Pre-AP Algebra course while accommodating the class time interruptions inherent in the 2nd semester of 8th grade. This class will be taught using techniques that are being called, "Blended Learning". This means that some homework requires students to watch a video that is the lesson for the latest topic. lesson presentations and have been incorporated in this class the past 2 years with great results. The first semester includes lots of lessons on the Graphing Calculator. It will also include lots of supplementary material about functions. There will be topics introduced throughout the year that do not appear in the textbook. They will be covered at the appropriate times that they naturally fit. Check the 100 Algebra Topics on this website to see what most of the topics are. Chapter 1: Expressions and Equations; this is a review of 7th Grade Algebra. 1-6, Introduction to Equations 2, or 3 days. Introduce the TI-84+ Graphing Calculator. 1 week. Chapter 2: Operations With Negative Numbers; this is a review of pre-algebra. 2-4, Multiplying Integers completed in 3, or 4 days. Chapter 3: Distributing Axioms and Other Properties; this is a pre-algebra review. 3-3, More Distributive Properties completed in 2, or 3 days. Chapter 4: Harder Equations; this is a pre-algebra review. 4-6, Problems That Involve More Than One Expression. 5-5, Factoring Quadratic Trinomials - 3rd Term Neg. Approx. 1 week. 7-5, Slope and Rapid Graphing Approximately 4 weeksschool, beginning the 1st week of . 7-6, Finding an Equation From Graph Done simultaneously with the reviews indicated, above. 8-2, Scattered Data and Linear Regression Approximately 1 week. The first semester, in this class only, ends on the last school day in December. When we return to class in January we will be working on second semester grades. the Algebra End of Year Test.